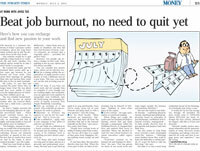 Beat job burnout, no need to quit yet. When things got rough, Ms Leahy and her husband attended a therapy retreat that put them through a programme called the Hoffman Process. It changed their lives and spurred their move to Australia, where she decided to start her own retreat business for senior executives called Legacy Process. "Everyone seemed to be burned out and looking for direction," she says. "Not one person we knew in our social circle was truly happy despite the bonuses and luxurious lifestyles." She says she wants to use holistic therapy – combining physical, mental, emotional and spiritual approaches based on principles of psychotherapy, meditation and financial resource management – to help people discover how to put passion and purpose back into their lives. She also wants to help them move towards a more meaningful work-life balance. "Although many bankers know they want to leave the field after a certain period, it's scary for them to take the first step," she says.